– What’s the likely timing for the closing of the deal? – Will there be escrow/warranty agreement(s) for a portion of the proceeds? – Will there be any related working capital adjustments on closing of the deal? – What are the tax implications of the deal, if any? – What FX hedging arrangements are in place (considering recent EUR/USD rate volatility) for this deal, if any? – Why is Pattern’s assumption of USD 102 million of net debt in the deal not disclosed? – Why is there no disclosure re the wind farms’ tax equity investors*? And there’s a potentially more disturbing aspect to this deal – Pattern Energy may ring a bell for shareholders. Chris Hunt, one of NTR’s non-executive directors, is actually a director of Pattern Energy Group LP – the main shareholder in Pattern Energy Group Inc. He’s also an MD at Riverstone LLC – where two of the partners, Lord John Browne & Michael Hoffman, are actually directors of Pattern Energy Group Inc. And prior to Riverstone, it looks like Hunt also worked for Lord Browne (at BP). Shareholders may also recall Riverstone (in a JV with AES Corp) previously purchased the 709 MW Imperial Valley solar project from NTR in 2011. Again, why isn’t any of this highlighted in NTR’s press release? Surely shareholders have the right to know what part (if any) Hunt played in this transaction & whether NTR’s board had appropriate corporate governance controls in place to avoid potential conflicts of interest, etc.? But even more disappointing is the announced USD 195 million proceeds. First, it seems an extraordinarily obtuse way of presenting the deal. I’m sure plenty of investors were eagerly awaiting the company’s sale of its crown jewels. [NTR’s net wind assets effectively represent its reported net worth]. At first glance, a shareholder might well calculate an equiv. EUR 183 million of proceeds & compare it with NTR’s current market cap…a much higher EUR 234 million! Who could blame them for being alarmed by such a comparison? But who could really fault them either – there’s nothing in the press release to confirm all of NTR’s wind-related loans/liabilities (which far exceed actual cash proceeds) will also be eliminated/extinguished in this deal!? Second, there’s the implied (gross) value of the deal. If you recall, a primary component of my prior NTR analysis was the Enterprise Value/MW for Post Rock & Lost Creek. Based on an original total project cost of USD 715 million (equiv. to $2.0 Million/MW), a capacity-weighted US average installed project cost of nearly $2.1 M/MW, and deal multiples generally ranging between $2.0-2.6 M/MW in recent years, I was pretty comfortable using an estimated depreciated book value of USD 651 million (i.e. $1.85 M/MW) for the lower end of my valuation range. Well, the buyer certainly appears to like the deal! Despite a veiled Q1-2015 production/profit warning, Pattern raised its cash available for distribution (CAFD) per share growth target to an impressive 12-15% CAGR (vs. a recent 10-12% CAGR) for the next three years, based on the deal with Wind Capital (plus an additional 90 MW deal). As did its shareholders – on Monday, Pattern’s share price initially spiked nearly 7% on the news, almost a USD 140 million increase in market cap! Here’s hoping we receive further/necessary clarification from management, as soon as possible – meanwhile, let’s work with the best info/estimates on hand & derive a new valuation range for NTR. [fyi My prior NAV range was EUR 2.68 to EUR 5.49 – now, we should be able to narrow our new range significantly]. What appears to be a disappointing deal multiple obviously bodes poorly for a new NAV estimate…but fortunately, as happens with many investments, we’ve also enjoyed an unexpected positive here (namely, a collapsing EUR/USD rate) which should offset a significant portion of the damage. Pro-Forma I & II: US wind farm assets moved to Trade & Other Receivables. 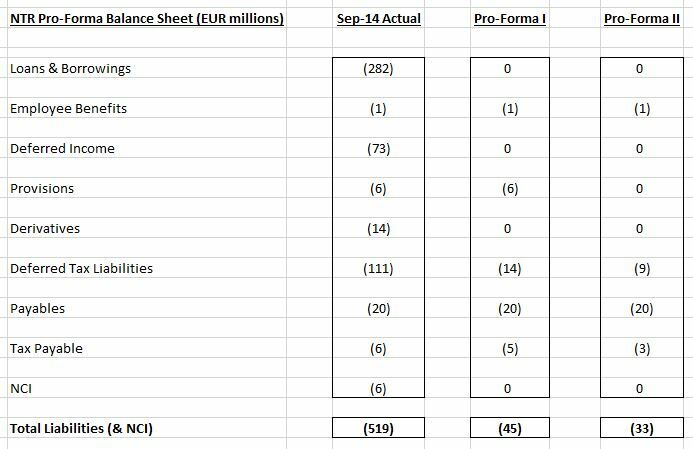 PP&E still inc. €14 million (M) of other assets (per last annual report), and subsequent net capex has been de minimis. Pro-Forma I & II: Assume Zero. Pro-Forma I & II: Remember, NTR holds ‘no debt at the centre’, and all project financing is at a subsidiary level & on a non-recourse basis – despite the lack of specific management confirmation, we can safely assume all loans & borrowings are therefore eliminated, post-sale. Zero. Pro-Forma I & II: The risk this US wind farm grant liability ever crystallised (or became repayable) was always remote & was due to be legally extinguished in 2015 anyway – any residual risk now passes to Pattern. Zero. Pro-forma II: Noting the substantial release of prior accruals/provisions in recent years, assume this remaining provision will be reversed/offset elsewhere. Zero. Pro-Forma I & II: All project financing is at a subsidiary level & on a non-recourse basis – despite the lack of specific management confirmation, we can safely assume all related interest rate derivative liabilities are therefore eliminated, post-sale. Zero. Pro-Forma I & II: Wind Capital Group minority interest now incorporated in Trade & Other Receivables. Zero. [NB: Share count includes 0.3 million restricted shares (for tax purposes). Any EU wind strategy investment (since the interims) is ignored – it may reduce cash (likely by single digit millions), but obviously won’t impact overall NAV. – Risks: i) If NTR has hedged wind farms sale proceeds, or any other dollar assets/liabilities, it could negatively impact this NAV range (likely by a single digit %, noting the current EUR/USD rate), and ii) NTR granted a USD 60 million environmental indemnity to Waste Management (from Jan-2013 ’til mid-2017, re its Greenstar disposal, see Note 29.f) – however, it has insurance cover in respect of a significant portion of this potential liability. Noting this coverage & the fact only USD 3.4 million’s been claimed to date, this risk appears fairly minimal. Based on this new Pro-Forma EUR 3.04 to EUR 4.04 NAV range, I’ll use the lower tertile of the range (i.e. weighted 2/3:1/3 towards the Conservative end of the range) this time ’round to determine my best estimate of NTR’s updated intrinsic value – this equates to a EUR 3.37 Fair Value per share. [This is a good place to remind investors of the risks of investing in grey market shares – as they say, talk to your broker (and/or see my previous post for brokers who actively deal in NTR shares)]. This continues to offer Upside Potential of 40% vs. the current EUR 2.40 share price (and now we obviously have the wind farms sale announcement & a commitment to a tender offer in hand). Which is again evidenced by the EUR 183 million (equiv.) wind farms sale proceeds – despite what appears (in my opinion) a disappointing deal price, it’s still double their reported EUR 90-95 million net book value (eyeballing the slide above, ex-Osage)! And investors should now be far more confident the remaining value gap will be closed – the wind farms sale has been announced & the shareholder agreement (between NTR’s three main shareholders) should obviously assure us the board will go ahead with a tender offer. In fact, the return of capital via a tender offer should also provide further reassurance: Shareholders could be unfairly penalised if they accepted a tender offer based on incomplete info, and/or an NAV per share that did not represent market values for all assets (& liabilities) – potentially exposing the board/company to legal action. [It’s important to also highlight the funding & timing of a potential tender offer here. Post-wind farms sale, NTR’s NAV will be highly liquid – liabilities should barely reach EUR 40 million, while cash should soon hit somewhere between EUR 220 M to EUR 264 million once Pattern Energy settles the wind farms cash consideration. If we then assume i) a tender offer’s priced at EUR 3.37 per share, ii) all external shareholders (approx. 59.5% of all outstanding shares) accept the tender, and iii) Tom Roche & management (approx. 40.5%) do not sell any shares in the tender, in aggregate the tender offer would cost a total of EUR 196 million – which can obviously be funded with cash on hand. Of course, I need hardly remind you One51 & Pageant Holdings each have major stakes in NTR (of 23.5% & 9.2%, respectively), and to date both have clearly demonstrated they’re highly engaged & determined activist investors. If there’s any disagreement over valuations, they can obviously push for further asset sales – for example, Celtic Anglian would be an ideal business to put up for sale in the current environment! [And every 5 cents increase in NTR’s NAV/tender offer price is worth an additional EUR 1.6 million to them, in aggregate – if that’s not sufficient motivation…I don’t know what is!?]. And Alan Walsh plays a particularly crucial role here – he’s an NTR director, so it would be intriguing to know how personally involved he’s been with the wind farms transaction, and how pleased or disappointed he actually is with the outcome. Of course, he is also One51’s CEO – i) disposing of non-core assets (like its NTR stake) is a key step towards going public, as he’s already stated, ii) the ultimate value of its NTR stake (perhaps EUR 78 million) is integral to One51’s own market cap (of EUR 211 million), and iii) clearly, he has a duty to his own shareholders to maximise the disposal value of this stake. [And study One51’s share register (see p. 23) – in turn, it has a large block of corporate shareholders who now have a similar vested interest in NTR & a duty to their own investors/members]. 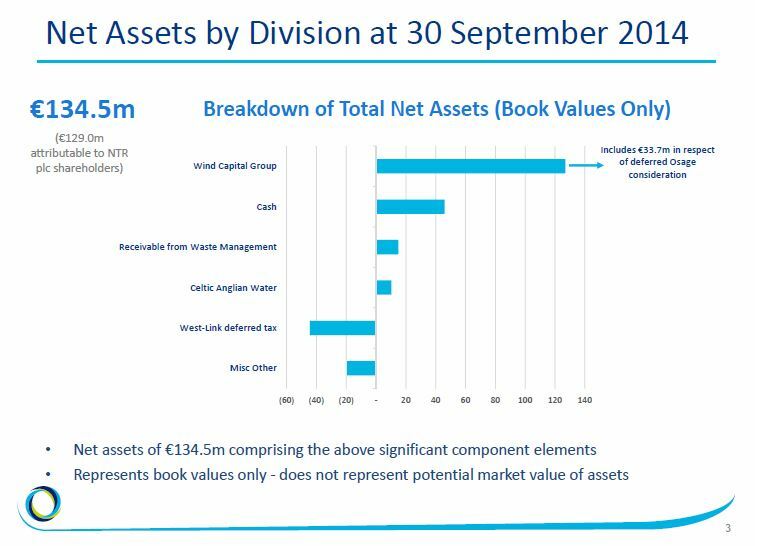 All in all, the NTR board is now under widespread & attentive scrutiny, in relation to this sale, the fair value of the balance sheet, and the ultimate realisation of value for all shareholders (in both NTR & One51). To date, NTR’s delivered a 53% gain for me (the majority of this gain actually occurred in the week after my original August write-up). NTR has now become my largest holding (a 10.9% portfolio allocation) – reflecting its appreciation, and my increased conviction & risk tolerance in light of the steady progression in its new value-realisation strategy. That would imply that if you buy back into Atlas stub post redemption there is potential to more than treble your money ? – At the outset, Altas NAV is minimal, and may remain unchanged for quite some time to come – i.e. substantial NAV write-ups will prob require actual asset collection/sales and/or the settlement/elimination of liabilities. – Shares could be very illiquid, with far less information flow – you may see little trading, and brokers will have little incentive to support a market in shares. Plus the market cap’s only going to be around EUR 20 million. – Shareholders will be seeing a cash return of just over 90% of their current NTR investment, and Altas will inevitably be a tiny allocation in investors’ portfolios. So the average investor may have little incentive to actually sell, esp. if they perceive there may still be substantial upside. But I will certainly try publish a fresh analysis if a good opportunity presents itself. So based on latest releases it looks to me like the true value is now somewhere north of €350m – or just over €3.30 a share – although trading at €2.40 which is a heavy liquidity discount given we will be bought out most likely in 4th qtr – have you run your slide ruler over expected payout Wex ? Old NTR’s administrative expenses should obviously be minimised, as it’s now essentially a wind-down vehicle – so anything over a minimal level of cash would be surplus to requirements. And since Dreamport doesn’t intend to actually redeem its stake in new NTR, this new vehicle will obviously have plenty of cash on hand for its European expansion plans. Therefore, the vast majority of NTR’s current cash pile of EUR 227 million can & should obviously be made available to shareholders via a share tender or redemption offer. 1. whats your guestimate of the value of the stub ? 2. Probability Roche family mount a buy out of these once the initial liquidity event occors and they have €75-90mn cash ? My NTR fair value range/target price (above) were €3.04-4.04 & €3.37 per share, respectively. But they were based on a 1.0650 EUR/$ rate, and 1.10-1.15 was actually locked in by NTR. And it’s now obvious Wind Capital’s FERC receivable & restricted cash (almost $50 million!) were included in the sale. [So the deal was even worse than I highlighted above..!?] I’ll re-do my numbers when I see the forthcoming circular – for now, let’s work with the lower end of my FV range, i.e. €3.04 per share. Which equates to €297 million of net equity – clearly, I still fundamentally disagree with NTR’s last reported net equity of €175 million (as of Mar-31st) & its post-sale net equity of €230 million. 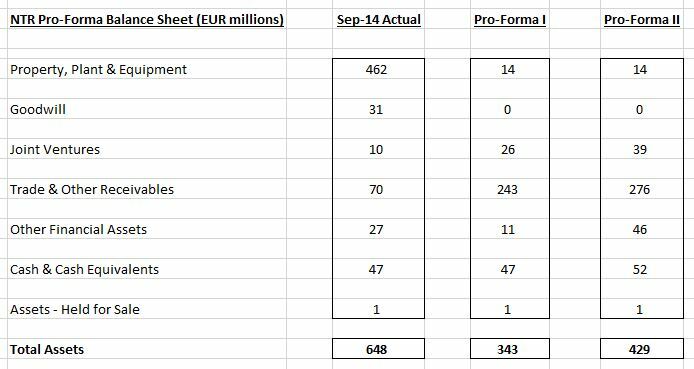 €6.2 million of cash remains in Old NTR…I don’t consider this cash necessary in terms of its working capital, or its operating costs (minimal, for what’s essentially become a passive investment company), but it would ensure Old NTR’s net equity actually remains positive! Of course, an (upward) revaluation of its assets/liabilities (for example, its CAW stake) would be a far more appropriate way of achieving this. This would imply €223 million of cash & €7.4 million of wind assets in New NTR – clearly, I’d expect a share redemption to be priced at €2.35 NAV per share. But whatever the figures, shareholders will obviously be able to redeem the majority of their current investment in NTR. And noting NTR’s current €2.45 share price, my scenario would leave shareholders with a €0.10 per New NTR share cost base. And per my conservative €3.04 FV per share above, that would imply a potential €0.685+ NAV per share still to be realised from New NTR. Thanks Wexboy, that all sounds pretty logical to me. 1. Do you account for all tax liabilities? i.e. ossage, the 83m being fully cancelled etc. 2. Where do you get the 1.10 locked fx rate? 3. Is it me, or this demerger is convoluted? How does New NTR retain 80m and tender only for 2.35? And Old NTR gets legacy assets/liabilities, and then all your upside is stuck in the iliquid grey mkt. How did the activists go with this? 4. Which one of the brokers they list would you recommend? liquidity, size etc. Not familiar with the Irish markets. Keen to know your thoughts as I dont have bandwidth to research it thoroughly in time. i) My valuation basically reflects all wind liabilities now being eliminated, no fresh tax liabilities being triggered by the disposals, and the West-Link tax liability being ultimately lower (than current bal sht value). iii) Yes, seems convoluted…but a good solution, given history/circumstances. Quite obviously, there was no agreement between management & major shareholders re fair values (vs. current book values) for remaining assets & liabilities. To avoid endless disagreement, and/or a significantly undervalued tender offer/buyout, shareholders agreed NTR will use its available cash to fund a share redemption, so shareholders will realise in cash virtually all their current investment in NTR (based on current share price). Presuming Tom Roche doesn’t participate, his share of this cash (80 million odd) will actually remain in New NTR, and his ownership of New NTR will approach 100%. All remaining upside for shareholders is ultimately based on the actual value realised from an Old NTR wind-down (rather than current book values) – so yes, it takes longer but it maximises value/upside, and investors will have a pretty minimal cost base/net investment in Old NTR anyway. iv) Davys & Goodbodys – see comments/links here: https://wexboy.wordpress.com/2014/08/24/ntr-plc-wind-of-change/ You may have to open an account, but ideally your current broker can simply deal with them on your behalf – I’d check this out sooner rather than later, as some brokers make it easy for a client to do something new/different, while others seem to relish making things impossible..!? What do you make of the recent redemption price? Do you still believe that the value of Atlas PLC is €0.68+, given the tax liabilities? Altas is now effectively highly leveraged (in terms of total liabilities vs. total assets), so investors should be pretty wary of the potential NAV impact of even a small change in assumptions about its eventual asset/liability values. And if you think NTR was illiquid, Altas could be far more illiquid (& non-tranpsarent)! So let’s hope management’s already working on the necessary steps for such an event…there’s certainly no need to wait around for receipt of the deal proceeds before beginning the process!